Sidney’s Darren Taborn drives as Troy’s Jaden Owens defends during a Greater Western Ohio Conference game on Friday in Sidney. Sidney’s Andre Gordon shoots with pressure from Troy’s Brayden Siler and Chris Demeo during a Greater Western Ohio Conference game on Friday in Sidney. Sidney's Josiah Hudgins shoots as Troy's Austin Stanaford defends at Sidney Friday. Sidney’s Ratez Roberts shoots as Troy’s Caillou Monroe and Shaeden Olden defend during a Greater Western Ohio Conference game on Friday in Sidney. Sidney's Keith Lee drives as Troy's Chris Demeo defends at Sidney Friday. Sidney's Josiah Hudgins drives as Troy's Austin Stanaford covers him at Sidney Friday. Sidney's Andre Gordon drives past Troy's Caleb Fogarty at Sidney Friday. 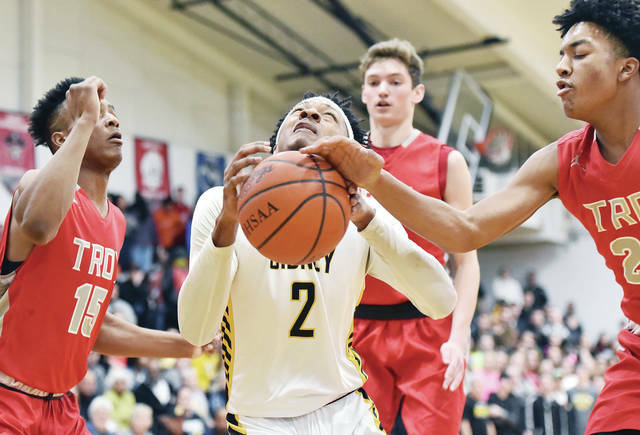 Sidney's Darren Taborn shoots as Troy's Caillou Monroe defends at Sidney Friday. Sidney's Josiah Hudgins shoots as Troy's Tre'Vone Archie and Chris Demeo defend at Sidney Friday. Sidney's Ratez Roberts dunks on Troy at Sidney Friday. Sidney's Dominick Durr shoots against Troy at Sidney Friday. 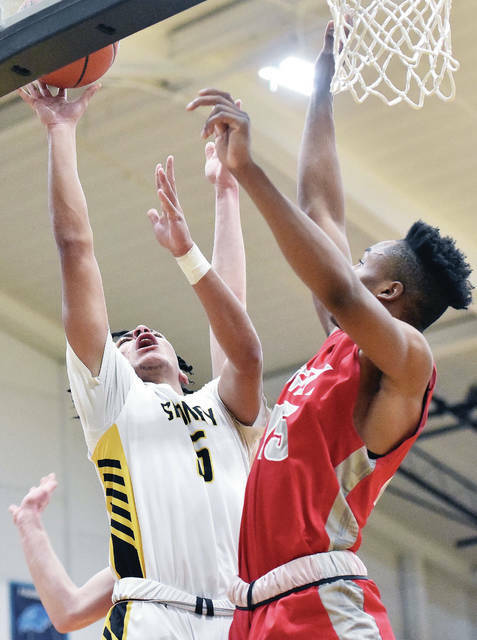 Andre Gordon shoots as Troy's Shaeden Olden defends at Sidney Friday. 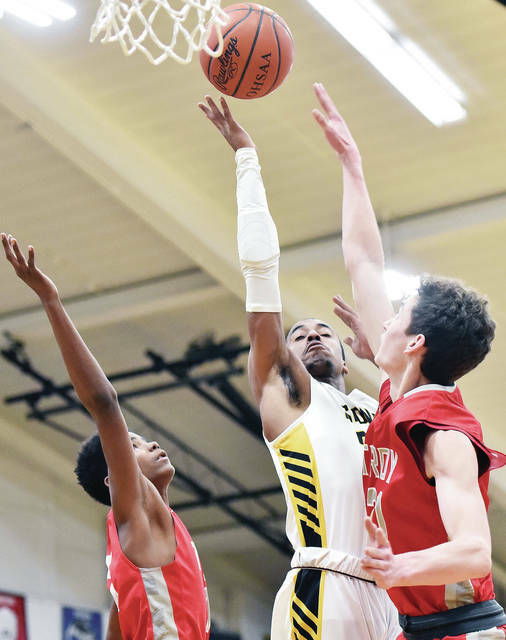 SIDNEY — Sidney’s boys basketball team finished a busy week on Friday night with its third game in five days. Luckily for the team’s players, they had plenty of time to rest up the last three days. Sidney canceled classes Wednesday, Thursday and Friday due to cold temperatures and a snow storm. The Yellow Jackets looked ready to go from the start on Friday and scored the game’s first 12 points. 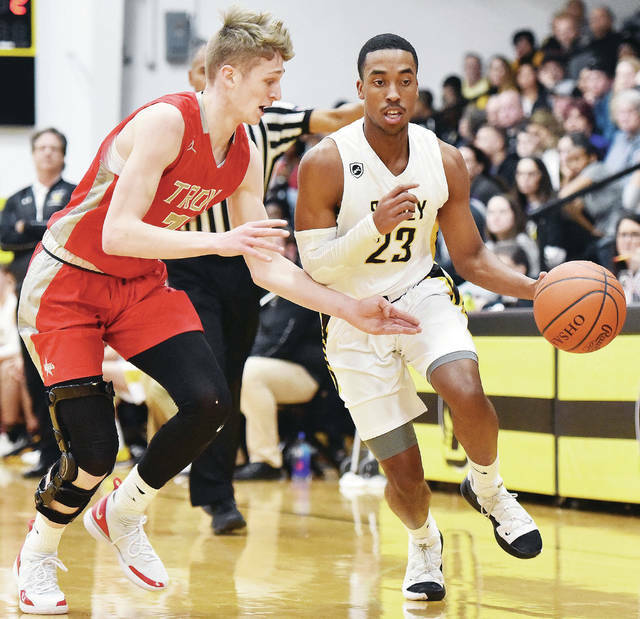 Though Troy battled back to keep it close, Sidney pulled away in the fourth quarter to a 56-48 win in a Greater Western Ohio Conference American North Division game. 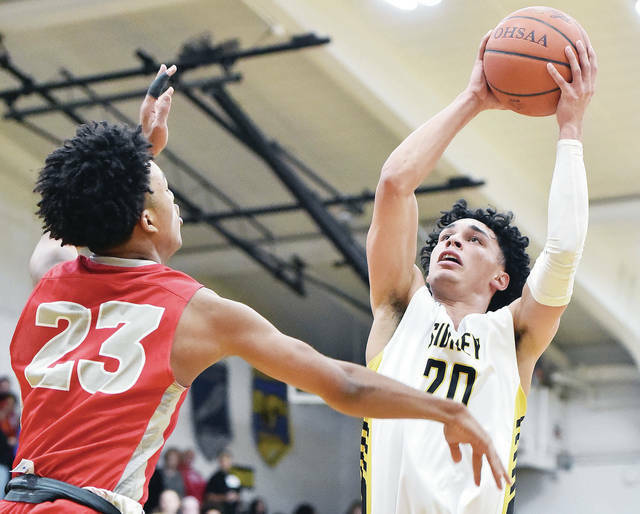 The victory was third since Monday for Sidney (14-3, 10-2 GWOC North) and keeps the squad on pace with Vandalia-Butler for first place in the conference. The Aviators crushed Greenville on Friday to improve to 10-2 in league play. 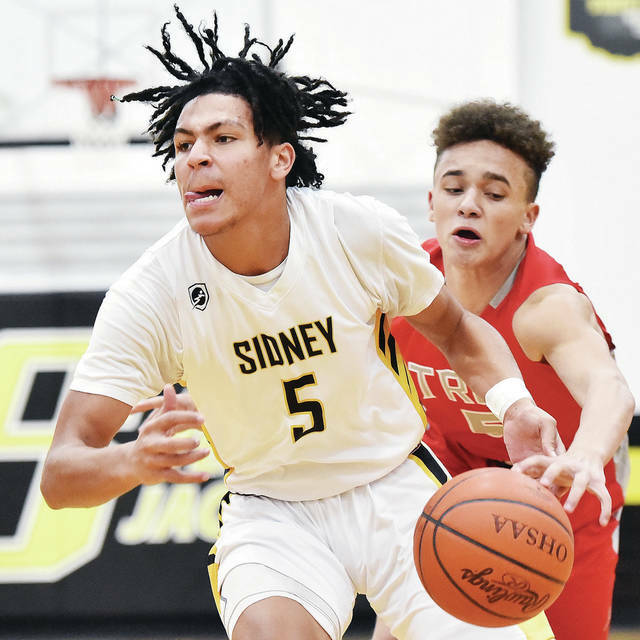 Sidney had lost two of its last three games before the current winning streak, and Willoughby said he’s happy with the way the team has powered through the last five days. “That may have something to with how we (didn’t pull away), high school kids playing that many games in a week,” Willoughby said. “I don’t want to make excuses, though. And though not being in school can allow you to rest, who knows what time they’re getting to bed and what time they’re getting up. That plays a big part. The long week will continue Saturday when Sidney plays at St. Marys, which entered a Western Buckeye League game on Friday against Lima Bath with a 4-9 overall record. The Yellow Jackets will return home on Monday for a nonconference matchup with crosstown rival Lehman Catholic. Troy (6-11, 5-7) had won two of its last three games entering Friday’s contest but couldn’t overcome the big early deficit. The Trojans did prevent Sidney from running away with it, though, and twice pulled within six points in the second half. A 9-0 run by Sidney midway through the fourth quarter iced the victory. 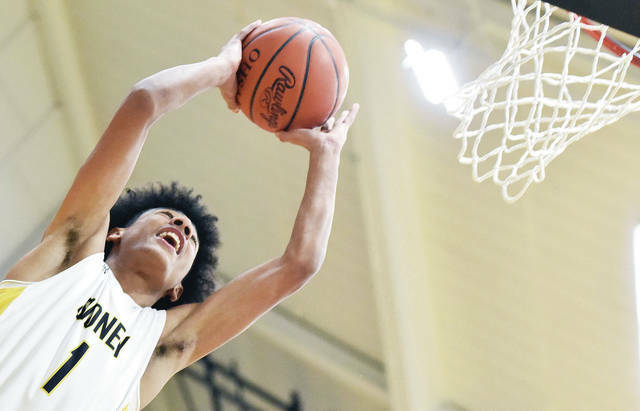 “We just didn’t take many good shots early and they made some good shots, and that’s kind of been our downfall,” Troy coach Paul Bremigan said. “We’re not patient enough to take good shoots. When that happens, you play a lot of defense. We played a lot of defense tonight and the time of possession wasn’t in our favor. Sidney led 28-17 at halftime. 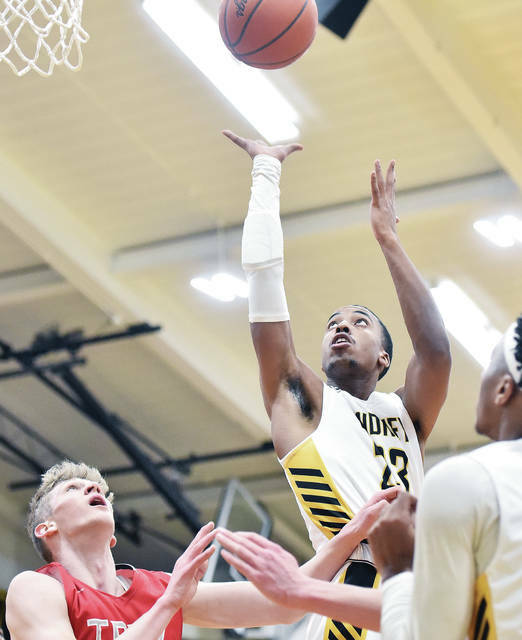 Keith Lee hit a basket with 5:23 left in the third to put the Yellow Jackets ahead 31-29, then the Trojans scored three straight baskets over the next 50 seconds to pull within 31-25. The Yellow Jackets twice pulled back out to a 10-point lead, including on a dunk by Andre Gordon off a lob pass from Roberts with 1:03 left that increased the lead to 39-29. Sidney had a 41-32 lead at the end of the third and scored the first basket of the fourth, but Caillou Monroe made a 3 with 6:52 left and Chris Demeo made a put-back 20 seconds later to pull the Trojans within six points again at 43-37. Troy couldn’t pull any closer, though. Gordon made a basket with 6:11 left, then Darren Taborn made a layup with 5:54 left to stretch the lead back out to 10 points. Gordon made another basket and split a pair of free throws, then Taborn made a basket with 3:17 left to cap off the 9-0 run and put Sidney up 52-37. Gordon, a Virginia Tech commit, led Sidney with 25 points. Taborn finished with 14 and Ratez Roberts added six points and had 10 rebounds unofficially. Willoughby was pleased with the performance of all three players and said Taborn’s points and Roberts’ rebounds were crucial for preventing Troy to focus on Gordon on Friday. Barring a tournament matchup between the two squads (which happened last year), it will be the last time the Trojans have to face Gordon. Shaeden Olden led Troy with 15 points while Monroe finished with 12. Troy missed its first nine shots on Friday and Sidney built a 12-0 lead by the midpoint of the first quarter as a result. The Trojans scored the next six points, though — including two baskets by Monroe — to cut the deficit to 12-6 by the end of the quarter. 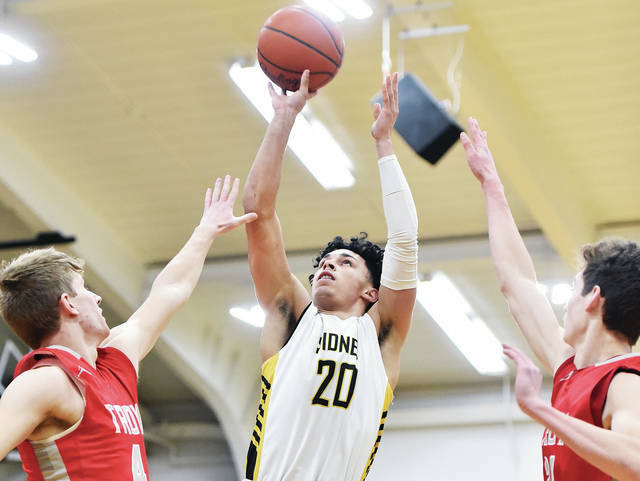 Gordon broke Sidney’s over four-minute scoreless streak with a basket with 7:26 left in the second, and the Yellow Jackets went on to take a 20-10 lead by the 5:15 mark. Troy scored the next five points, though, and came within 20-15 after a bank-shot 3 by Monroe with 4:04 left. The Yellow Jackets controlled the rest of the quarter. Gordon scored two consecutive baskets, then Roberts made a short jumper and a two-handed dunk to boost the lead to 28-15 with 1:20 left. The Yellow Jackets will look for shooting improvement on Saturday in St. Marys. Troy’s next game is at home on Friday against Butler. Friday’s game was the seventh time Willoughby and Bremigan have faced off while at Sidney and Troy, respectively. The Yellow Jackets have won each matchup. The duo were long time coaches at Shelby County Athletic League schools before moving to their current GWOC jobs. Willoughby led Houston for 30 years before moving to Sidney in 2016. Bremigan coached at Russia for 31 years before taking the Troy job in 2015. Sidney’s Josiah Hudgins shoots as Troy’s Austin Stanaford defends at Sidney Friday. Sidney’s Keith Lee drives as Troy’s Chris Demeo defends at Sidney Friday. Sidney’s Josiah Hudgins drives as Troy’s Austin Stanaford covers him at Sidney Friday. Sidney’s Andre Gordon drives past Troy’s Caleb Fogarty at Sidney Friday. Sidney’s Darren Taborn shoots as Troy’s Caillou Monroe defends at Sidney Friday. Sidney’s Josiah Hudgins shoots as Troy’s Tre’Vone Archie and Chris Demeo defend at Sidney Friday. 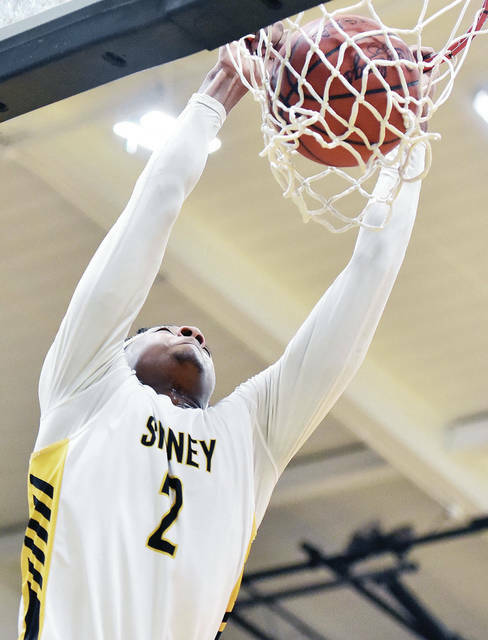 Sidney’s Ratez Roberts dunks on Troy at Sidney Friday. Sidney’s Dominick Durr shoots against Troy at Sidney Friday. 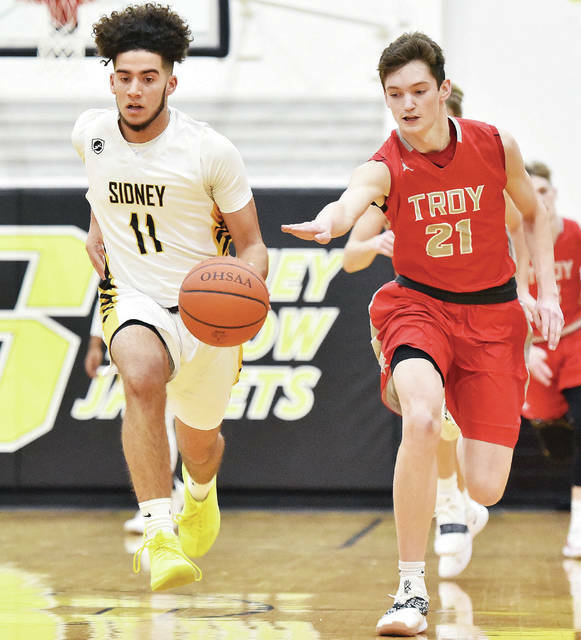 Andre Gordon shoots as Troy’s Shaeden Olden defends at Sidney Friday. 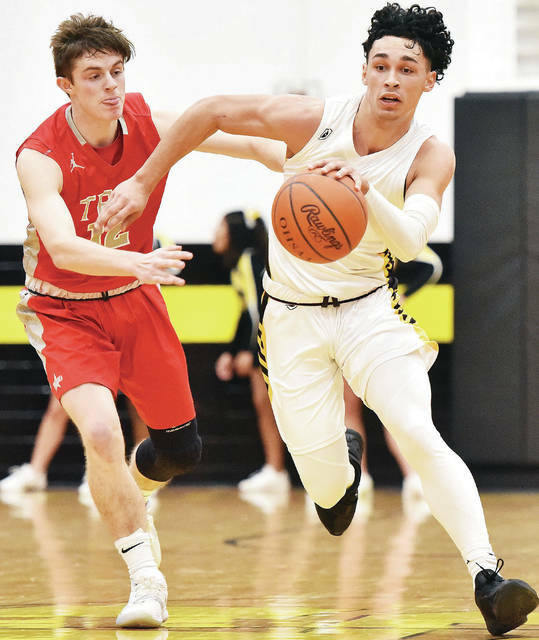 This entry was tagged Andre Gordon, basketball, boys basketball, Greater Western Ohio Conference, GWOC, GWOC American North, high school, John Willougbhy, North, North Division, Paul Bremigan, picture, pictures, Ratez Roberts, result, score, statistics, stats, Troy, who won. Bookmark the permalink.